While some technological breakthroughs, such as small modular reactors and molten salt reactors, are making the planning of future nuclear power plants increasingly enticing, new nuclear reactors notoriously take years to build and even longer to get funded, approved, and permitted. 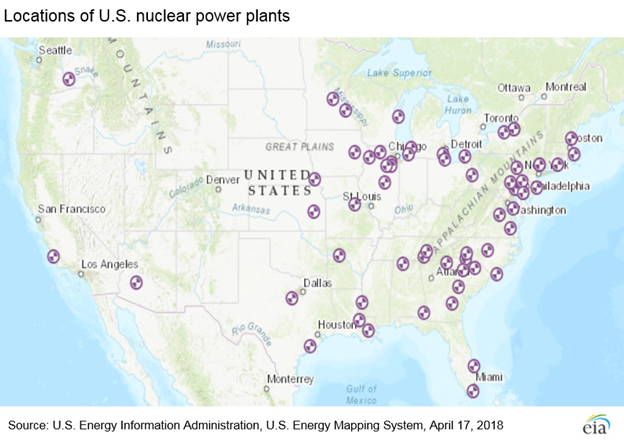 Because of this natural delay before new plants can be built, preserving the existing U.S. fleet of nuclear plants is of the utmost importance. Various strategies have been debated, and some already implemented, by different government entities, with the reception and success being mixed thus far. Why do nuclear plants need preserving? While environmentalists and climate advocates would like to see the electric power sector switch to 100% renewable energy, the fact is that renewable energy today has not yet been built out widely enough to cover the nation’s electrical needs, and more importantly renewable sources are intermittent in nature (i.e., solar power is unavailable when the sun isn’t shining, and wind power is fruitless when the wind isn’t blowing) requiring baseload plants to fill in the gaps. While these issues could be resolved in the future if long-term electricity storage options become cost competitive, as it stands today nuclear power remains critical to the U.S. grid as a reliable source of baseload power generation. The alternative to nuclear power as baseload power use fossil fuels, such as coal and natural gas. Because these fossil fuels emit significant amounts of greenhouse gases and other air pollutants into the atmosphere and contribute to climate change, it is important to consider ways to preserve or even enhance the presence of nuclear power in the U.S. energy mix. So while nuclear power only provides about 20% of U.S. electricity, nuclear generation accounts for over half of the country’s low-carbon electricity. The problem facing nuclear power recently, however, is that competition from increasingly cheap natural gas, reductions in the cost of renewable generation, and projections of limited growth in U.S. electric power demand are all pushing nuclear power out of the market. According to the Energy Information Administration (EIA), only 60 nuclear power plants, with a total capacity of 99 GW, operate in the United States today and 9 of those plants (capacity of 11 GW) have already announced plans to retire by 2025, with EIA expecting that total capacity to drop to 79 GW by 2050. What have state governments tried? New York and Illinois have both implemented policies that reward carbon-neutral generation through zero emission credits (ZECs). While many states had already offered renewable energy credits to solar and wind producers, ZECs include nuclear power in the mix of energy sources rewarded for their carbon-free electricity generation. These ZECs are worth varying levels of financial compensation depending on the state and the year the credits are earned, but this financial incentive for generating carbon-neutral power helps nuclear plants in these states level the playing field with the competition from natural gas and renewables. In fact, in 2017 four nuclear plants reversed their decision to close after receiving ZECs from their states, and Connecticut, New Jersey, Pennsylvania, and Ohio are now considering similar support measures. Some states have attempted to give a boost to the nuclear field through energy portfolio standards that include mandates for nuclear power. Again, taking a page out of the renewable playbook, these standards would be akin to renewable portfolio standards but instead would mandate a certain percentage of a state’s power generation that must come from nuclear power. Unfortunately, these legislative efforts have been largely unsuccessful, including failed measures in Arizona, New Jersey, Illinois, and New York. While nuclear mandates failed in several state legislatures, some states still found it worthwhile to pass bills expressing support for nuclear power in other ways (even if they aren’t as forceful). For example, New Mexico passed measures to support the development of nuclear waste storage in the state and to evaluate the feasibility of small modular reactors, while several other states proposed bills asking that nuclear power be included as a way in which states can meet the U.S. Environmental Protection Agency (EPA) Clean Power Plan (though the fate of the Clean Power Plan is currently on hold pending legal challenges). In late 2017, the Trump administration put forth a plan to bolster nuclear and coal power plants with financial subsidies to counteract the financial stress they were feeling and to ensure these plants would be available to provide baseload power during times of supply shortages. However, the Federal Energy Regulatory Commission (FERC) rejected that plan and sent the federal government back to the drawing board. In June 2018, the White House directed the U.S. Department of Energy (DOE) to take immediate action to stop the early retirement of nuclear and coal power plants that are considered fuel-secure. DOE’s proposed strategy in response was to compel grid operators to buy electricity from at-risk nuclear plants. The outcome of these efforts is still up in the air. What are other potential solutions? Power purchase agreements, or contracts wherein a buyer guarantees they will buy a certain amount of electricity from a power producer, could be implemented by government agencies and/or state and local governments with nuclear plants, or those governments could even incentivize businesses to participate in power purchase agreements with nuclear-powered plants. Carbon pricing strategies are another method of incentivizing carbon-neutral generation, but instead of rewarding less emissive generation they would impose a financial penalty on carbon emissions. The net result would be similar, with carbon-neutral nuclear generation becoming more cost competitive. While environmental concerns of nuclear waste products are often cited as a negative aspect of nuclear power, improved waste disposal methods such as geological disposal, dry cask storage, and reprocessing have proven successful in storing the byproducts in a safe, clean, and environmentally-responsible manner. As the United States is home to many of the oldest nuclear plants in the world, many are coming to the end of their 60 year-operating licenses and at least 20 of them (according to a 2016 survey) are planning for second license renewals when due in 2029. While new construction costs for nuclear plants are prohibitive, extending the licenses of existing plants allows them to continue to reap the benefits of improvements in cost of generation, safety improvements, and efficiency upgrades, as well as the previously mentioned benefits. Such extensions on licenses could be the difference between closing due to inefficiencies and blossoming under a second life of new advanced reactors or improved infrastructure more amenable to nuclear generation. To learn about how OnLocation can help you explore solutions for energy issues such as methods of preserving at-risk nuclear power, visit http://www.onlocationinc.com/contact-us or contact us at contact@onlocationinc.com.